This deduction is good on new and used equipment, as well as off-the-shelf software. To take the deduction for tax year 2019, the equipment must be financed or purchased and put into service between January 1, 2019 and the end of the day on December 31, 2019. The above is an overall, “birds-eye” view of the Section 179 Deduction for 2019. For more details on limits and qualifying equipment, as well as Section 179 Qualified Financing, please read this entire website carefully. We will also make sure to update this page if the limits change. 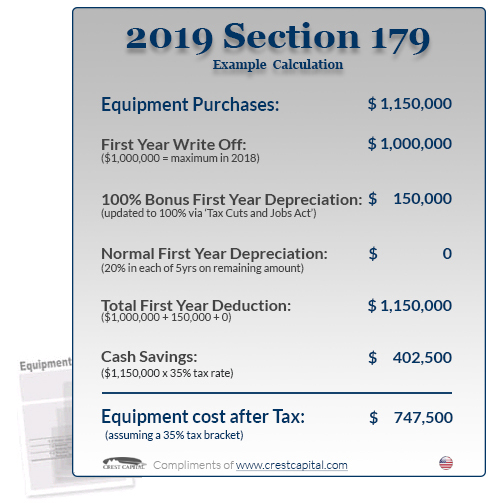 Here is an updated example of Section 179 at work during the 2019 tax year. We’ve compiled a handy guide to Section 179 for previous tax years. Click the links below to be taken to the year of your choice.